Is this electric car company secretly building the Apple Car? Could Apple be taking the super secret route? Recent rumblings on the internet suggest a car manufacturer, Faraday Future, could just be a very expensive front for Apple's rumored electric car. Faraday Future cropped up on the car-making scene earlier this year as a clear Tesla competitor (the company name also draws from a famous scientist, Michael Faraday), but the company only revealed its plans in some detail this week, saying the start up will invest $1 billion in a US, state-of-the-art manufacturing facility in either California, Georgia, Louisiana and Nevada. Along with creating an electric vehicle, the company "plans to explore other aspects of the automotive and technology industries, including unique ownership and usage models, in-vehicle content and autonomous driving." "With energy constraints, urban crowding, and the increasingly intrinsic relationship we have with tech- nology, today's cars simply do not meet today's needs," said Nick Sampson, senior vice president of Faraday Future. "Our range of 100% electric and intelligent vehicles will offer seamless connectivity to the outside world." While the company has revealed that it has a global team of 400 "automotive and technology experts," along with naming number of key employees - including key ex-Tesla employees, including Sampson, who was the former director of vehicle and chassis engineering at Tesla - the CEO of the company has not been revealed. It has led to a report by the New York Post to suggest the missing CEO lends to the rumor that there might be more to Faraday Future than meets the eye - the whole company could be a dummy front for the production and development of the rumored (but likely inevitable) Apple Car, as naming a CEO, which is likely an Apple executive, would give away the ruse. The report also draws on the mystery surrounding where the company's $1 billion investment money is actually coming from, with Faraday Future saying to the Wall Street Journal that it keeps its partners confidential (though a Bloomberg report suggests the start up has some form of backing from Chinese online video game billionaire Jia Yueting). The report by Post also points to Faraday Future hiring numerous former Tesla employees, suggesting a connection to reports earlier this year that Apple was poaching Tesla employees. Of course, nothing is confirmed, and using an entire start up company as a front for developing its own car seems like a very complicated procedure to just keep the lid on rumors of a possible Apple Car. But, still, it's possible. 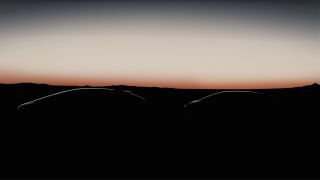 We'll be getting in touch with Faraday Future about the rumors, as well as keeping a close eye on what Faraday Future electric car will look like. Apple Car to hit the roads by 2020?